Motorola’s MBP36 Digital Video Baby Monitor with 3.5″ color LCD screen is the perfect addition to your child’s nursery or bedroom. Equipped with 2.4 Gigahertz FHSS technology to prevent crossed signals and to promote sound clarity. The 3.5″ color LCD screen with 25 FPS refresh and infrared night vision will allow you to easily monitor the room environment, even in the dark, to ensure your child’s comfort. The pan, tilt and zoom of the camera can be remotely adjusted while your child sleeps. The MBP36 is also equipped with impressive features like: room temperature monitoring, five polyphonic lullabies, additional camera capability, five LED alerts for noise level. This monitor also has a range of up to 200 meters and out of range warning, allowing you to move around the house or yard comfortably, knowing you will hear when your little one is awake. Motorola’s MBP36 Digital Audio Baby Monitor will give you the reassurance that your child is resting peacefully. Equipped with 2.4GHz FHSS technology for sound clarity, you can feel comfortable your little one will come through loud and clear when they need you. A 3.5″ LCD color display shows sound and video monitoring, with infrared night vision. Data encryption is built-in for added security. The MBP36 digital audio baby monitor has an impressive range of up to 200 meters with an out of range warning, allowing you to move around the house or yard comfortably, knowing you will hear when your little one is awake. 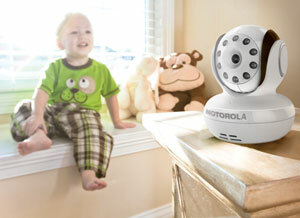 The MBP36 Digital Audio Baby Monitor by Motorola is the perfect choice for any parent or caregiver. 3.5″ LCD color display shows sound and video monitoring, with infrared night vision. The 2.4GHz FHSS technology offers a more reliable wireless connection over previous cordless technologies such as 900MHz cordless antennas. That means better range and less chance of missing something important in your baby’s room due to a weak or dropped signal. The MBP36 also features two-way communication for being able to speak or sing to your baby remotely, or to communicate with a partner in the room. A full-color 3.5″ LCD display shows real-time video and sound in your baby’s room with up to 25 FPS video playback, letting you can keep informed of what’s going on visually as well as audibly. Infrared night vision means you can stay in touch with what’s going in your baby’s room without any lights to disturb little sleepers. Control the MBP36’s camera remotely to pan, tilt, and zoom the video image as needed. Featuring remote pan, tilt, and zoom to allow for capturing video where it’s needed. Lull your baby to sleep with one of five polyphonic lullabies programmed into the MBP36. The Motorola MBP36 encrypts the audio data it transfers for added security and peace of mind. Five LEDs on the MBP36 baby monitor indicate the level of sound activity in the room, keeping you informed of what’s going on visually as well as audibly. The MBP36’s transmitter is equipped with a room temperature sensor which is reported on the receiver’s LCD display. You can ensure that it never gets too hot or too cold for your little one. The superior wireless range of the MBP36 lets you keep connected to your baby up to 200 meters away. So even if you have a larger home, you don’t have to give up safety or the ability to stay connected to your little one. An alarm sounds when you’re getting out of range of the transmitting unit, so you’ll never have to wonder if you’re close enough to hear what’s going on.